Delicate textured melt in your mouth pancakes. In a large bowl, whisk together the ricotta, milk, egg yolks, sugar, lemon zest and juice until smooth. Sift together the flour, baking powder, 1/8 teaspoon of the salt over the ricotta mixture and stir with a wooden spoon, just until combined. In another bowl, whisk the egg whites until frothy. Add the remaining 1/8 teaspoon of salt and continue beating until soft peaks form. Slowly add the egg whites into the ricotta mixture. Let batter sit 15 minutes to let the baking powder do its magic. Preheat a griddle over medium heat. Ladle 1/3 cup batter onto the griddle for each pancake. Flip and cook for 1 more minute. Serve with fresh fruit or blueberry sauce. 225 members have added this recipe to their cookbook. Absolutely delicious! Fluffy, flavorful, pancakes. Used sugar free maple syrup first time, but I'm looking forward to serving it with other toppings. Added 1 tsp lemon exctract, and used Egg Beaters insted of whole eggs. (less cholesterol) And topped with strawberry sauce made from Welches' spread, lemon juice, and water- heat on the stove untill boiling, and pour over pancakes! I make this with soy milk instead of cows milk, quinoa flour instead of white flour, and I add about a 1/2 scoop of protein powder. Great recipe. Excellent oatmeal pancakes make for a smashing breakfast. 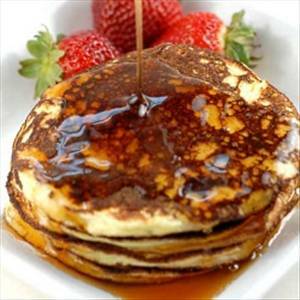 Quick, easy and yummy pancakes. A healthier option for pancake lovers. There are 113 calories in 1 serving of Lemon Ricotta Pancakes. Calorie break-down: 8% fat, 66% carbs, 26% protein.